Wow -- what a great perspective. I love the falls in the winter. Nice job. Can just about feel the spray. Great shot. random question...how did you get the copyright information below your posts and do I need wordpress or other program to do it? Isn't that the Canadian side? I thought the Canadian side was a lot wider and more impressive... but maybe I'm wrong! What a gorgeous picture! It could be a postcard. I've never been to Niagra Falls but that photo is spectacular! Zetor - Thanks! 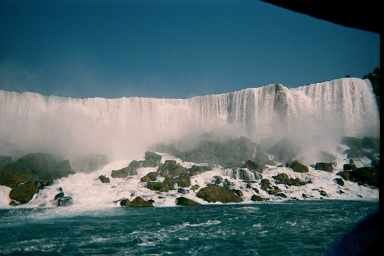 My husband and I took a boat tour that got us somewhat close to the falls. We could feel the spray on the boat. Aarti - No, it's the American side. The Canadian side doesn't have all the rocks and boulders you see in front of the Falls in this photo. The Canadian side is a bit wider, but the American side is impressive in its own right as you can see. Sandy, Melody & Kathleen - It is beautiful. I loved it there. Staci - This photo was taken on our second trip there. I'd love to go again someday. Wendy, I am such a dork! I saw this title on a couple of other blogs and wondered if this was something new. When I saw that you had participated I had to check it out. Love your pick. I studied the falls a few years ago and fell in love with them. How beautiful! Sorry I haven't been around lately-haven't been feeling too well. Beautiful shot! How I wish I could be there! Nancy - Isn't it? I love Niagara Falls. The history of the falls is so fascinating! Dar - It's okay. I haven't been around much either, unfortunately. Alice - Thank you. I wish I could be there right now too! Standing directly under the Bridal Veil Falls on the American side is one of my favorite places anywhere. Nothing on the Canadian side compares to taking the elevator down and then walking on the red decks under the falls. Love it and have done it twice. Even with all of that rock buildup that has formed at the base, the falls are still incredible. Stacy - I've walked underneath the Falls on the Canadian side, but not the American side. Lisa - I agree! So beautiful!